Hemlock woolly adelgid, Adelges tsugae, is an invasive insect in eastern North America. It feeds on Canadian Hemlock, Tsuga Canadensis. 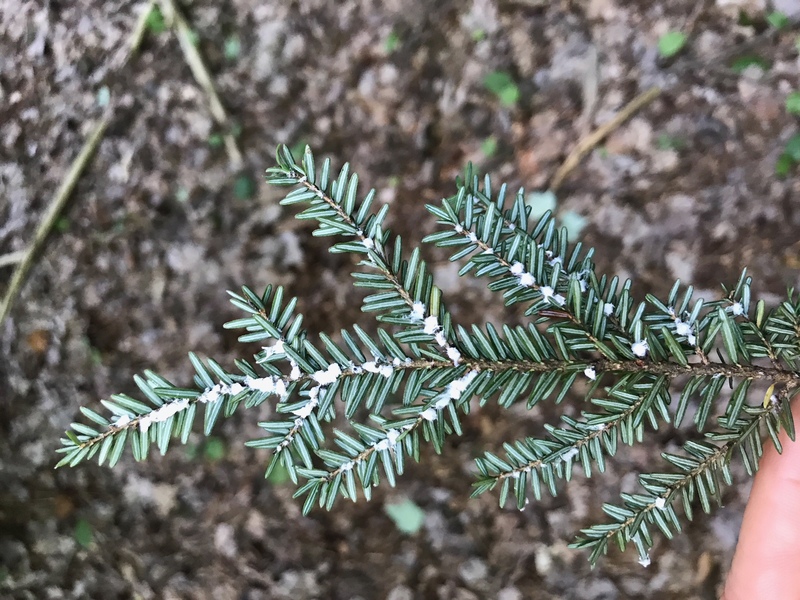 The insect was discovered last summer feeding on a mature stand of Hemlocks on Little Mountain on a property located on the grounds of Holden Arboretum. Although it is uncertain how the adelgid got there, it is thought that it arrived on birds migrating north. Because of the discovery, both counties have been quarantined. Canadian Hemlocks grown in nurseries located in Lake and/or Geauga County, Ohio will have special requirements and restrictions on movement of their hemlock nursery stock. The Ohio Department of Agriculture will put a protocol including inspection and treatment in place for the 2018 growing season. Hemlock woolly adelgids are small and are most notable by their woolly covering. The insect has two generations per year and growth occurs from fall through late spring. Insects in summer are inactive and scarcely visible at the bases of needles as black dots, sometimes referred to as looking like a speck of black pepper at the base of the petiole. Woolly masses develop in October and are present thereafter through June of the following year. In the eastern USA, Adelges tsugae is killing eastern hemlocks (Tsuga canadensis [L.] Carrière) and Carolina (Tsuga caroliniana Engelm.) in large numbers from Connecticut south along the Appalachian Mountains. From Massachusetts north, or at high elevations, tree mortality has been slowed by higher rates of mortality of adelgids in winter due to low temperatures. Chemical control includes the use of Imidicloprid by trunk injection. Imidicloprid can also be applied to the soil as directed by the label. The systemic insecticide has been found to be effective in controlling the adelgid and is most effective when applied in the fall. A biological control program is in progress against this pest, based on specialized predatory beetles that feed only on adelgids, collected in western North America (Laricobius nigrinus Fender) or China/Japan (species of Laricobius and various Scymnus ladybird beetles). To date, releases have not demonstrated any reductions in adelgid densities from predators. Populations of L. nigrinus have become well established and abundant in some areas of western North Carolina.